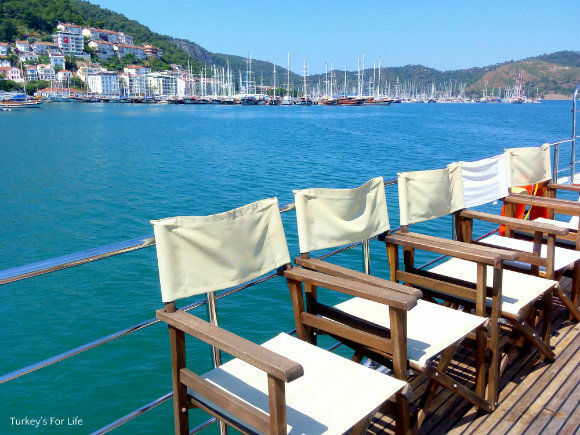 Turkey ▸ Fethiye ▸ Things To Do In Fethiye ▸ Help Beach & Yacht Club, Fethiye – Love It! 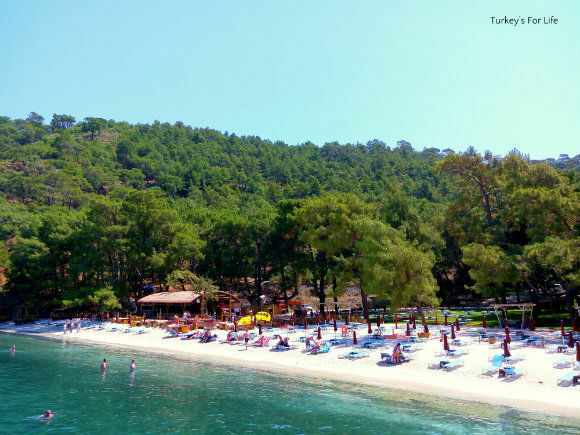 Help Beach & Yacht Club, Fethiye – Love It! What a great day we had! 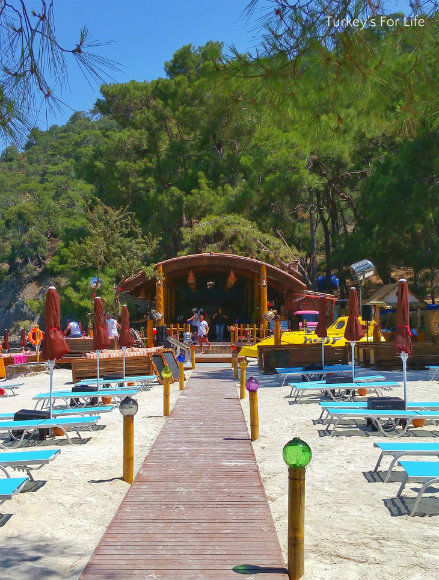 We need to tell you that there’s yet another new addition to the Fethiye beach scene and, as with all newcomers, we were excited and just had to go and check it out. But we had to bide our time. Mixed weather since their opening day didn’t really make for ideal beachy pastimes so we waited for the sun to shine. And eventually, shine it did. Off we went to Help Beach and Yacht Club. And this is the tale of our first of (hopefully) many visits. We’ve known all winter about the arrival of Help Beach in Fethiye and have been patiently waiting for the opening to be announced. We’ve kept an eye on their Facebook page, too, so when they announced there would be a free shuttle boat service to and from Help Beach – well, what better way to arrive at a beach than by boat, eh? Idyllic! So we took ourselves off to Fethiye and walked along the harbour towards the obelisk memorial in Uğur Mumcu Park. This was where the Facebook page had said the boat would be. And yes, there it was; two oblong orange banners with ‘Help’ emblazened in blue. So far, so good. We don’t go out for the day too often in Fethiye so it felt like a real little outing. More chuckling all round. And on this day, the beachy gods were smiling upon us. Not only were we the first customers on the boat, but, as soon as we took a seat to wait in hope, a lady arrived to ask what time departure was…because she was with eight other people! Happy days. And then four Russian tourists embarked, too. This trip was on! So, the captain and crew are happy bunnies – they’ve finally got a job to do. And the beach goers are happy bunnies, too. Well, they get to go to the brand new Help Beach. Because there’s much curiosity and buzz around this new arrival. 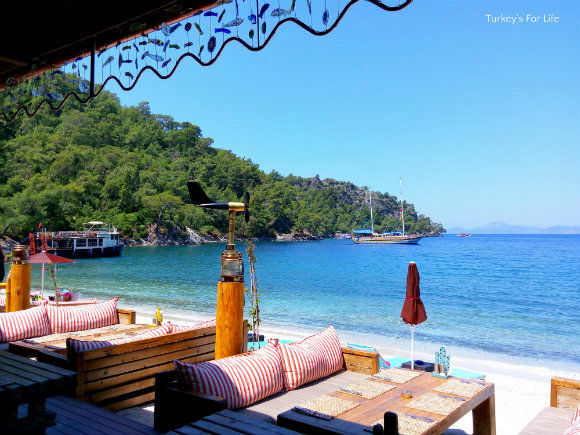 Any readers who know Ölüdeniz will no doubt know Help Bar on Belceğiz Beach. Well, the whole bar is no more because owner and furniture transported themselves to Fethiye and around the peninsula to what was Küçük Boncuklu Koyu. A beautiful cove with calm azure waters, nestled into forested hillside. 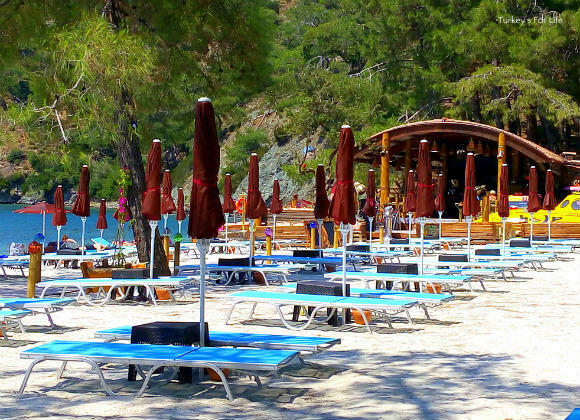 A beach club to be created here by one of the most established business names in the Fethiye beach bar scene. And if some of the the furniture had been transported, well, all those same vibrant colours were going to be a part of that, too. A friend had told us he’d been a couple of times over winter. It was looking fantastic, he said. If you follow us on Instagram, you’ll know my phone was in overdrive on Instagram Stories. Photos and videos of the journey along the Fethiye coastline, past Aksazlar Bay and the beaches of Letoonia Resort. Afterwards, the rugged coastline of the peninsula revealed the bays of Küçük Samanlık, Büyük Samanlık, the wide sweep of Kuleli Beach and then Büyük Boncuklu. Eventually, our shuttle boat slowed and we rounded into the bay and towards our destination. Well, we did say the boat was a perfect way to arrive, didn’t we? Just look at the scene that greeted us! There was Help Beach and its jetty waiting for our arrival. Three staff were waiting eagerly on the jetty – we were their first arrivals by the shuttle boat. Up to now, most guests had driven there, but summer will hit soon and you just know this boat is going to be busy, busy, busy before long. We got off the boat and everything was as we expected it to be. The whole scene just said, “Help,” with colours galore. And the great thing about arriving at a brand new beach in early season, on a weekday, during Ramazan and early in the day, is that you get to have a good look around and get a feel for the layout without masses of other people being there. A wooden walkway with (of course) multi-coloured lamps leading the way took us straight to the bar and restaurant area. Help Beach is open at nights, too, and these lamps are hanging from the trees as well as lighting the pathways. Hopefully, we’ll get to spend an evening there, soon. As you enter the bar area, this is where the clues of Help’s previous existence make themselves more obvious. Huge chunky wooden chairs of varying colours, chillout music and a bar in the style of a submarine. We took a seat and were handed separate drinks and food menus, both packed with oodles choice. Not that you’d think it from what we ordered! First visit and all that. We like to keep it simple, then we can see if the food’s to our liking. Barry ordered the menemen and I went for a simple, plain burger. The burger menu had all manner of fillings and sizes but it was only just lunchtime so I decided it was wise to keep things a tad on the lighter side. Servings are ample and Barry’s menemen had cheese in it, too, as well as a side of four chunky slices of bread. My burger was homemade and served on a homemade bun. It was topped with lettuce, tomato and griddled onion and served with fries. The photo doesn’t do it justice but all was very tasty and I struggled to finish it – but I did finish it! 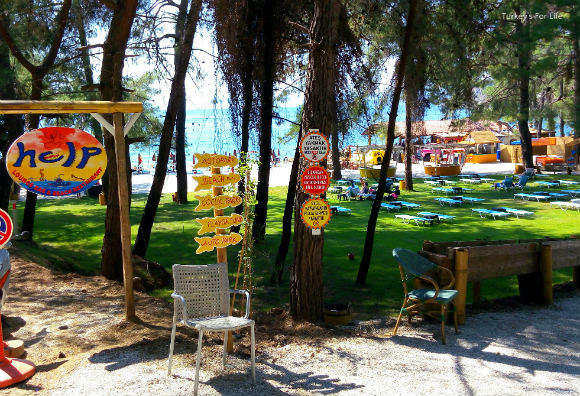 All of this was enjoyed whilst soaking up Fethiye’s stunning coastal scenery – the views from Help Beach are pretty special – and washing it all down with glass of beer. And we just know you’re thinking now, “And how much did all this set you back, then?” We’ll tell you in a moment. 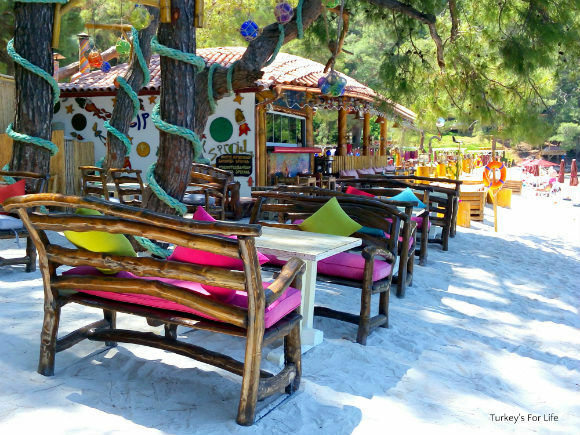 First, we’ll show you some more of this little hidden Fethiye bay that is Help Beach and tell you a little bit more about the food offerings. You see, we sat in these seats, in the shade, for sometime and, by and by, people started to drift in for their late lunch. Much craning of neck going on as the waiters walked past with various orders. Help Beach isn’t just about people being packed onto sunbeds, soaking up the rays. You still feel like you’re at a bar or a beach restaurant, too. If you’re like us and not much into being horizontal under the blazing summer sun, there’s so much lovely shaded seating, all of it looking out to sea. You feel yourself to be on a secluded desert island – except you’re on a peninsula and the centre of Fethiye is just over the hill, around the corner. We’re just in love with all these little hidden areas. Further back, köşks made from the same wood, climb up the hill amongst the pine trees. The cushioned seating was still being placed when we were there and we can’t wait to return and just tuck ourselves away in one of these for the day. I remember our teacher reading Enid Blyton’s Magic Faraway Tree series to us whilst in the infants. The scenes I pictured as a kid from the first book, The Enchanted Wood; well, they all just came flooding back to me when I saw all these colourful köşks, cushions, globe lights and ropes. We can see ourselves here on numerous occasions during the hot summer days! And when nature calls, or the time comes where you want to change from beachwear to your more daily attire, well, I just couldn’t resist getting a photo of the loos and changing areas. All the colours are there again. And just look at this Victorian- style loo. You certainly don’t feel like you’re on a beach in a forest! Outdoor showers, changing cabins and loos, certainly all fit for purpose! Despite donning swimming gear for the first time this year, neither of us ended up going for a swim. But I did get my feet wet while taking some photos. We’re definitely in acceptable swimming temperatures now so our next visit to Help Beach & Yacht Club will see us submerging ourselves in the Mediterranean waters. The sea is so clear around these peninsula bays, and, although not a huge fan of the stuff, the imported sand makes it a tad easier to get in and out of the water. The bays are natural pebble and stone beaches and you’ll notice that as soon as you get a couple of metres or so away from the shore. Eventually, the time came for us to leave Help Beach & Yacht Club. Not before getting a shot of this Help submarine, however. I’d decided, with its wibbly wobbly lines, myriad of colours and submarine shaped bar, the theme for Help Beach is that of an underwater world. And then Barry pointed out The Beatles connection, too. 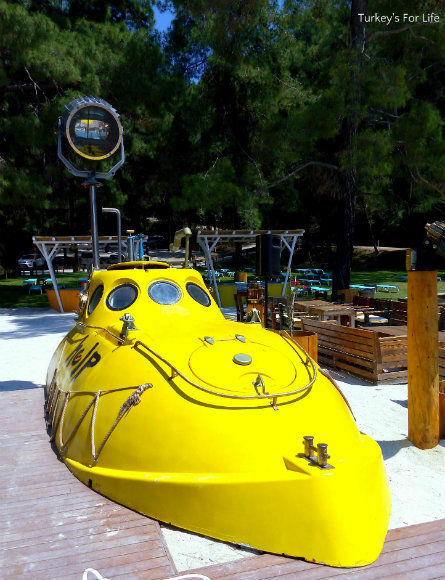 The name of the beach – Help – and a big yellow submarine at the entrance to the bar. Coincidence? Guess we’ll have to ask, next time. 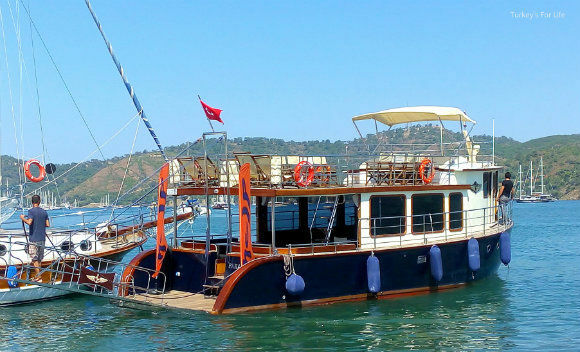 Now, we could have taken the free service boat back to Fethiye harbour in the early evening. However, despite the hot and sunny day, we decided to climb away from Help Beach and amble back to town just out of curiosity. How long would it take us? 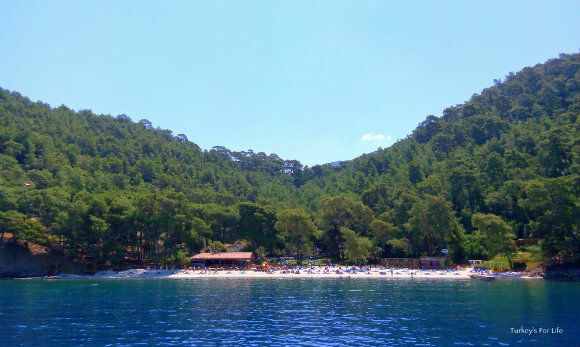 You see, this bay (also known as Gökgemile Koyu) is just on the right, straight dowhill from the crossroads for Hillside Beach Club and the forest track to Kayaköy. A bit of a tough pull back up the hill in the heat of the sun but it was short and sharp and then we were enjoying the scenery over the boatyard and across Fethiye…downhill all the way. We were back down to sea level in no time and, as you can see, if you decide to go to Help Beach by road – either on foot or with wheels – it’s signposted at the junction just past the Marina Boutique Hotel. Incidentally, the business partnership that involves Help Beach & Yacht Club has also got the contract for Büyük Boncuklu, too. They’re going to be open this summer and will have fast food offerings as well as your usual sunbathing and swimming opportunities. 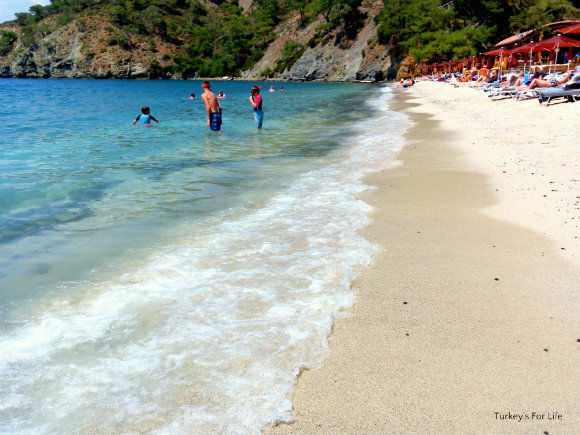 This means, should you decide to walk around the whole Fethiye peninsula in summer, you’ll have a choice of 8 different beaches at which to take a breather. Help Beach & Yacht Club is brand new so information could change as the season progresses. We’ll try to keep this as up to date as possible but be aware that anything can change. We went to Help Beach & Yacht Club by the free shuttle boat service. The boat leaves from the harbour, in front of the obelisk memorial in Uğur Mumcu Park. If you do want to go to Help Beach by boat, keep an eye on their Facebook page as times change throughout the season. Entrance to Help Beach & Yacht Club is free. If you are sunbathing, there is a charge for sunbeds and umbrellas. Help Beach & Yacht Club isn’t cheap but, for us, the prices are just about right for the atmosphere being created here. A few examples: A large draught Efes is 18TL (around £3.70), as are the freshly made smoothies. Soft drinks are 6TL. 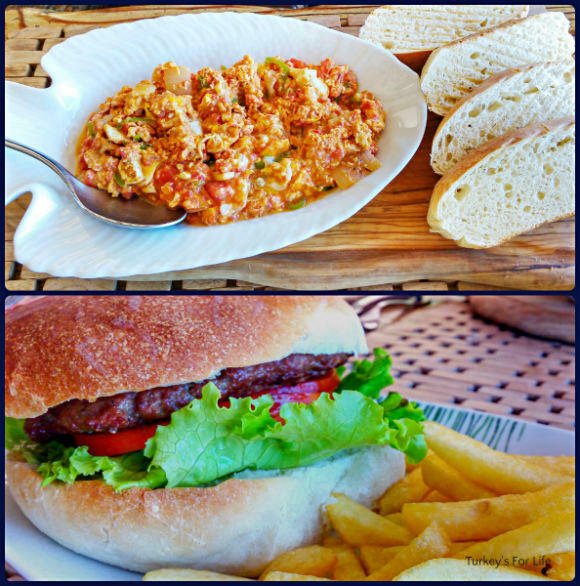 Barry’s menemen was 25TL and my burger was 30TL. Once we factored in the free return shuttle boat service and no entry fee, it all felt quite reasonable. We’ll be using Help Beach & Yacht Club for special days out so those prices work for us. By the way, if for some reason you want to walk it to the beach from Fethiye, follow the initial instructions for our walk to Kuleli but turn off to the right immediately AFTER the crossroads at the top of the hill. You should see the sign for Help Beach from the crossroads as you head briefly towards Hillside Beach Club. From Marina Boutique Hotel, it’ll take you about 30 minutes. Click into our page for other ideas of things to see and do in Fethiye. 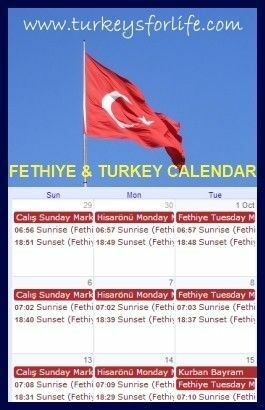 You can book hotels in Fethiye through Booking.com. Autumn Scenes Along Çalış Beach – Sad Or Serene? This place looks absolutely fab – thanks for sharing it with everyone! Looks a bit like a Thai island resort – and prices cheaper than a meal on the front in Bodrum without the free boat trip. Funny you should say that, BacktoBodrum. Our friend said Help Beach was looking a bit Thai when they were putting it together over winter. 🙂 Ha ha, yeah, we know those Bodrum prices!